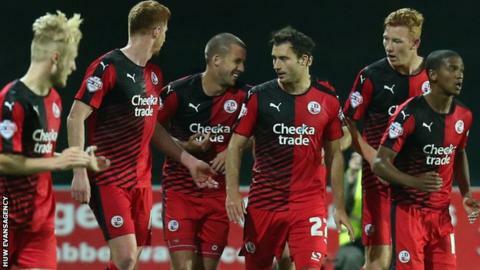 Gwion Edwards struck twice as Crawley comfortably beat Newport to win League Two's basement battle. The former Swansea City youth player shone on his return to Wales, scoring both his goals from long range in the first half. He then provided the cross for Matt Harrold to head in and seal the win. Newport rallied but could not hit the target as Crawley climbed out of the relegation zone, leaving the hosts with one win at the bottom of the table. Terry Butcher's side had secured their first win of the season three days earlier with a 1-0 victory at Carlisle United. "I don't know if we actually left the team we played at Carlisle up the M6 and brought home a load of strangers because that's how we played. "It's bitterly disappointing to put on a performance like that in front of our own fans because a lot of them have been away and seen us play and seen the resilience and toughness. "That certainly wasn't there tonight but fair play to Crawley, they've dominated the game and it could have been more than three." "It's a massive win for us because obviously we've lost our last four and it's nice to get back on track. "We have a young side, and you know they are going to make mistakes, sometimes costly mistakes. But what was really pleasing for us was some young players put in a 90-minute performance. "We are working hard on the training ground to get better and the manager deserves a bit of credit. "I've never met a manager that works as hard as he does and he deserved those three points, because he takes all the brunt and takes the pressure off the players, and he's a good guy." Match ends, Newport County 0, Crawley Town 3. Second Half ends, Newport County 0, Crawley Town 3. Attempt saved. Alex Rodman (Newport County) left footed shot from outside the box is saved in the centre of the goal. Attempt missed. Roarie Deacon (Crawley Town) right footed shot from the centre of the box is close, but misses to the left. Attempt saved. Matt Partridge (Newport County) header from the centre of the box is saved in the centre of the goal. Liam Donnelly (Crawley Town) is shown the yellow card for a bad foul. Attempt missed. Alex Rodman (Newport County) left footed shot from outside the box misses to the right. Substitution, Crawley Town. Simon Walton replaces Jimmy Smith because of an injury. Attempt blocked. Mark Byrne (Newport County) right footed shot from outside the box is blocked. Ross Jenkins (Crawley Town) is shown the yellow card for a bad foul. Tyler Blackwood (Newport County) wins a free kick in the defensive half. Substitution, Crawley Town. Roarie Deacon replaces Rhys Murphy. Tom Owen-Evans (Newport County) is shown the yellow card for a bad foul. Substitution, Newport County. Medy Elito replaces Kieran Parselle. Corner, Newport County. Conceded by Liam Donnelly. Substitution, Crawley Town. Bobson Bawling replaces Gwion Edwards because of an injury. Kieran Parselle (Newport County) wins a free kick in the attacking half. Goal! Newport County 0, Crawley Town 3. Matt Harrold (Crawley Town) header from the right side of the six yard box to the bottom left corner. Assisted by Gwion Edwards. Attempt missed. Matt Harrold (Crawley Town) header from the centre of the box misses to the right. Corner, Crawley Town. Conceded by Scott Barrow. Attempt saved. Rhys Murphy (Crawley Town) right footed shot from the centre of the box is saved in the centre of the goal.